A circular island display based on a curved grid and employing near-standard grid hooks. 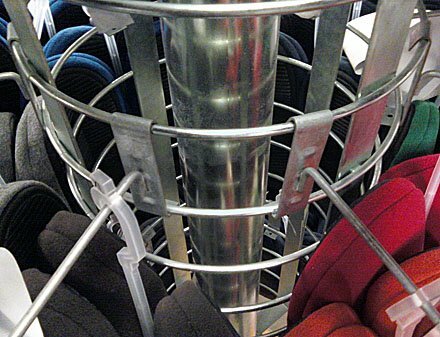 The hooks appear to be custom-from-stock, in that the upper flanges open wider than norm to accommodate the slight curve of the grid (See side view of hook flange in upper right corner). Since they are otherwise standard hooks, the minor manufacturing modification would be hardly noticed cost-wise if purchased direct from the manufacturer.